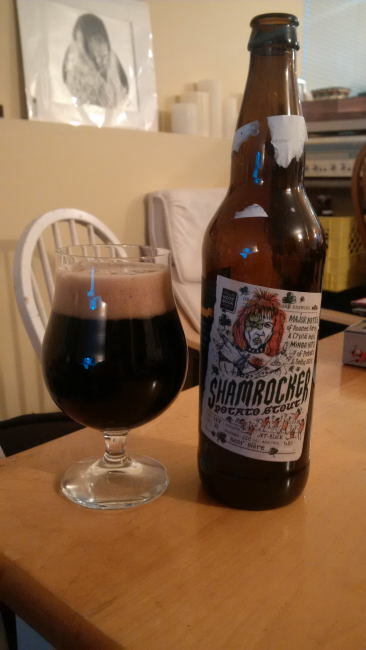 From Granville Island Brewing out of Vancouver comes their new “Shamrocker Potato Stout” the newest addition of the Black Note Book Series form Granville Island’s Vern Lambourne. The stout pours a deep opaque black colour with a brown head. The aroma consists of roasted malts, barley, coffee and an overall sweetness. The flavour is of roasted malts, barley, coffee, hops bitterness and maybe a hint of potato in the finish. The alcohol content of this dry Irish stout is 4.8% with an IBU of35. This would be an amazing beer to add to the standard lineup of Granville Island Brewing as long as it does not change! This is a great full flavoured stout with a nice hint of potato making it all that more Irish. Commercial Description: Get ready to rock out to this dry Irish stout. With amped up tones of roasted coffee, barley and malts, it’s a medley of Celtic proportions. Food Pairing as per brewery: Pairs up nicely with fresh oysters or blue cheese. This entry was posted in Stout and tagged barley, bc, bitter, bitterness, black note book series, canada, coffee, granville island, granville island brewing, hopped, hops, hops bitter, hops bitterness., mild potato, potato, roasted malt, roasted malts, roasty malt, roasty malts, shamrocker potato stout, vancouver, vern lambourne. It was pretty darn tasty. I hope you live in an area that sells it! Perfect thing for St.Patrick’s Day, huh? It really was. Although it would be perfect for any day really.